The distinctive style of Julian Opie’s sculptures, paintings and films is known throughout the world. Always exploring different techniques both cutting edge and ancient, he plays with ways of seeing through reinterpreting the vocabulary of everyday life. 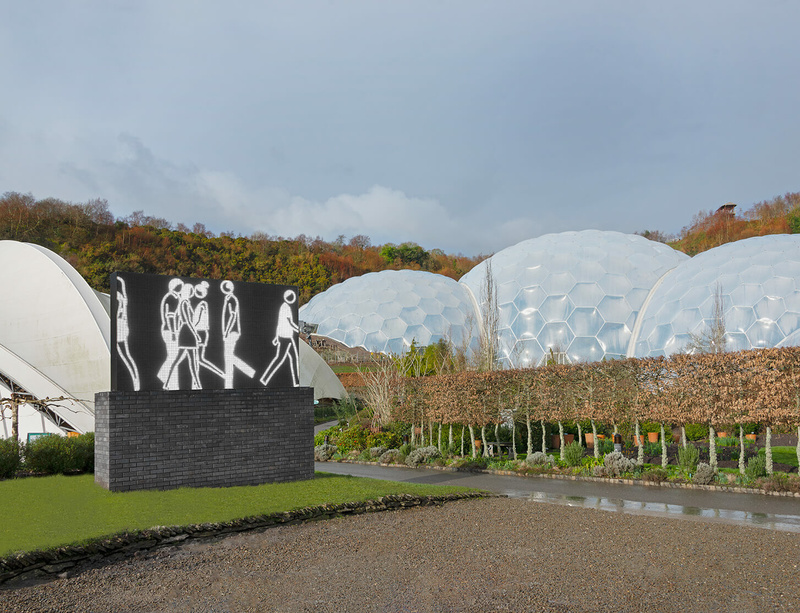 ‘In this new work, created especially for the Eden Project, a small group of people walk together but remain independent – they create a monument of a crowd or a flock. Looking back, I have drawn a lot of walking people. It is the most natural and commonly seen form of human movement and also what makes us different from most other animals. An individual’s gait is particular and as revealing as your handwriting or voice. Like ancient Greek or Egyptian striding statues the human body makes sense while walking and has a grace and sense of dynamic purpose. ‘LED panels carry an urban authority, usually giving precise information or dispensing traffic commands. The brick plinth speaks of drive-in restaurants or garage forecourts but also the high plinths of city monuments. I have drawn the figures in the language of the sign, a universal and immediate language unburdened by details but remaining specific and individual nonetheless.’ – Julian Opie.